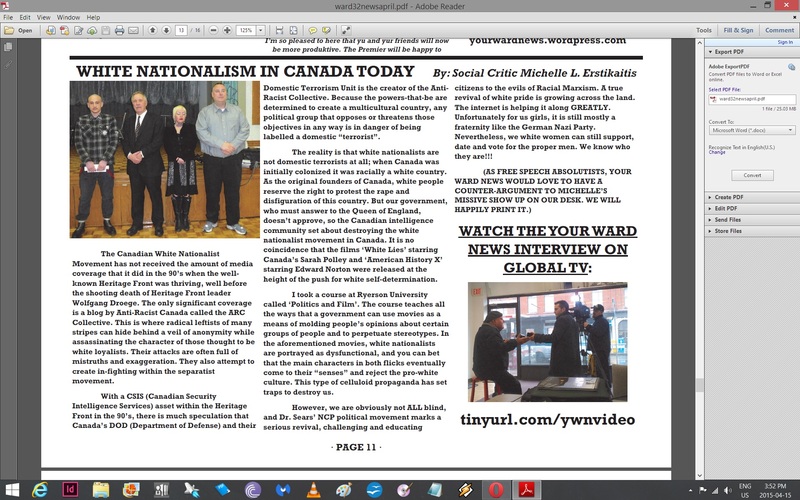 In their recently released April edition, apparently being delivered by Canada Post, Your Ward News dedicates four full pages to promoting the New Constitution Party. 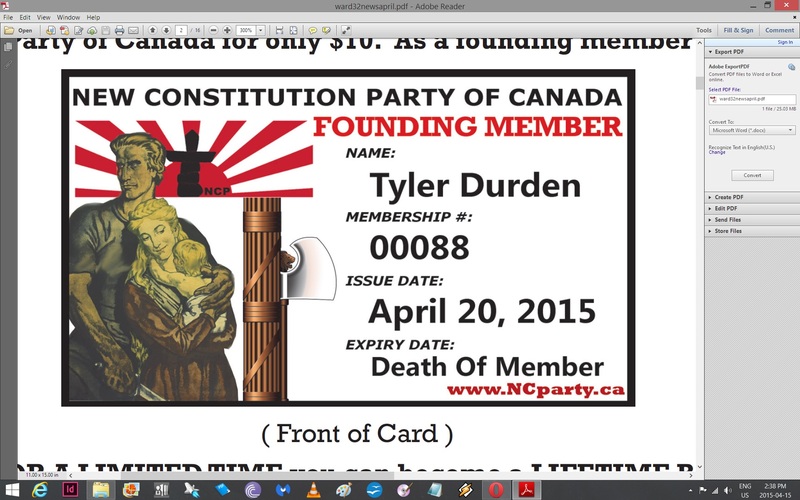 The second page includes an image of NCP’s membership card. Note the fasces, the symbol of Italian fascism. Also note the membership number, 88 – code for “heil hitler” amongst Nazi scumbags. And further note the issue date, April 20th – Hitler’s birthday. Aside from the Nazi play on words, the article goes on to defend holocaust denier Ernst Zundel, and invokes racist anti-Semite David Irving, and the pseudoscientific and widely disproven Leuchter Report. Much of the rhetoric of Nazis in Canada and abroad tries to frame racism and fascism as “free speech” issues in order to obscure fascism’s true intent. Whether genocidal scumbags should have the right to promote their thoroughly meritless ideology is debatable (I personally couldn’t care less about their free speech “rights”). But if free speech exists for fascists, that creates a responsibility for decent people to be vigilant and fight against fascism wherever it tries to use free speech to establish itself. 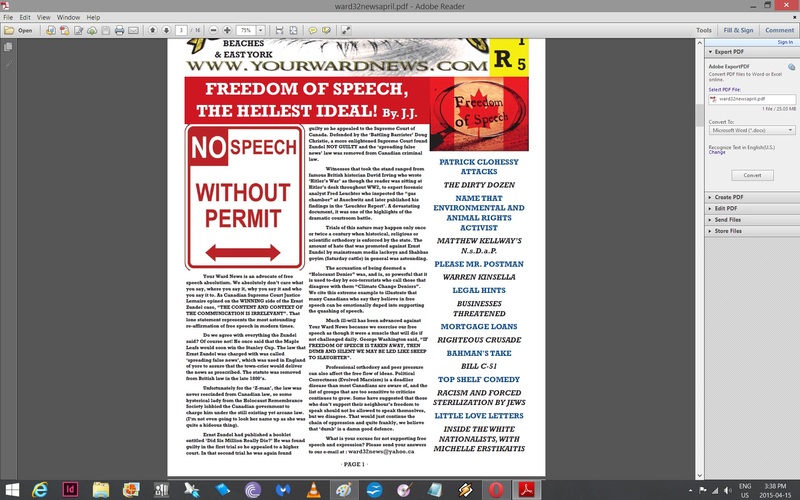 The issue also includes two articles by Nazi/Paul Bernardo fan Michelle Erstikiatis, the second of which is an analysis/endorsement of White Nationalism in Canada. 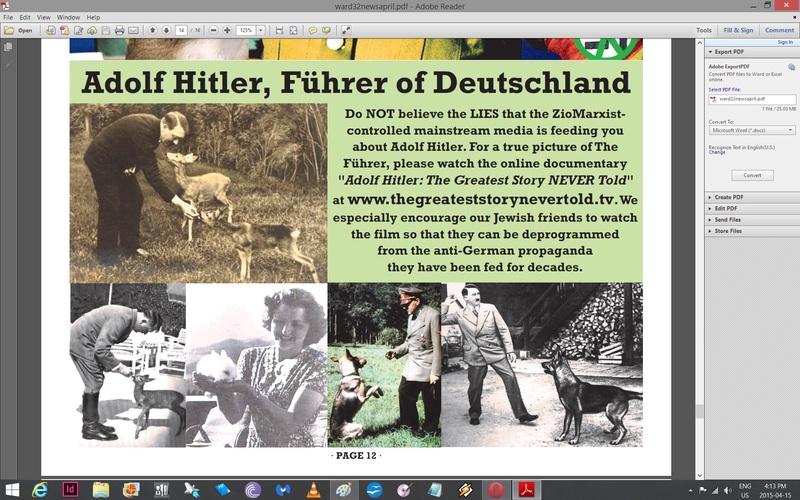 And there’s a bizarre full page comparing Hitler to David Suzuki, and promoting Hitler’s “softer” side as an animal lover, and someone who the “ZioMarxist controlled mainstream media” is feeding you “LIES” about. Full Nazi folks. Delivered by Canada Post.